This is a typical non-Catholic Creed. It was forwarded by a Catholic asking if they could/should agree with this creed in order to get a new job. What do you think of this creed and could you sign onto it? If you think there are errors, what are they? No. Cannot do. #1 – Bible “only infallible . . .”; #3 “Vicarious death” ??!! #4 Uh – define regeneration. The Bible isn’t infallible, it’s inerrant. Infallible means “incapable of making an error”; the Bible is an inanimate object, incapable of doing anything. Salvation is by grace alone, through faith and good works. I see a problem in #1, #4, #6. 1. The Bible IS NOT the ONLY thing one needs. As it says in 1 Timothy 3: 14 – 15. Catholics indeed believe that it is inspired. But there is a difference between the Bible being authoritative and it being the ONLY authority. It is indeed also infallible. Also you can ask where in the Bible does it give you the Cannon of Scripture? And by the way, what’s inspired is where it starts verse 1 and on… Not the title. The chapter and versus weren’t put in from when they began to write the Scripture, that was put in later on. And NOT everything is written in the Bible because it would become to cumbersome to carry. 2. This one is fine, it’s talking about the Trinity. Only I would ask them if they believe in Bible Alone or Sola Scriptura; I would have to ask where is the word Trinity in the Bible? And how do you know it’s called Trinity and NOT something else? 3. I would say that this is fine, but it leaves out the Holy Spirit even though it is metioned in the following article, if you will. 5. Again you need BOTH faith and works. 6. Sounds to me like predestination. Not Biblical!!! I know a lot of people who would be “considered” saved and yet, they could be on their way to Hell. Sounds like “Once Saved Always Saved”. 7. Not just spiritual unity but also bodily unity. We are the BODY of Christ. There is no “invisble” Church only. It is both visible and invisible. 8. I agree that everyone is created in the image and likness of God from conception till natural death. There is 1 thing missing from this whole picture….. What about Mary the Mother of God? If it wasn’t for Mary you would have no incarnate Jesus. I can actually go on and on, but I am going to stop here. I should add to #1. The original documents are infallible what we have are inherrent. Neat! I didn’t know you could make up your own creeds! That is very, very handy. No, as a Catholic I could not in good conscience agree to this statement of faith. 1. Error; the Bible is not the only infallible, authoritative Word of God. Alos, technically we say the Bible is inerrant, not infallible. 1, 2 and 4. Please give answers. Thanks. Missed 6. This was a great exercise, to see how words can be mixed up and you miss simple problems. Thanks again. I was asked to signed such a statement of faith at our local Pregnancy Counseling Center 12 years ago, where I have been volunteering since. Their statement of faith stated amongst other things: “I believe and agree, the Bible is the sole rule of faith and authority.” (paraphrased) I refused to sign it, explained why and advised them I would sign either The Nicene Creed or the Apostle’s Creed. 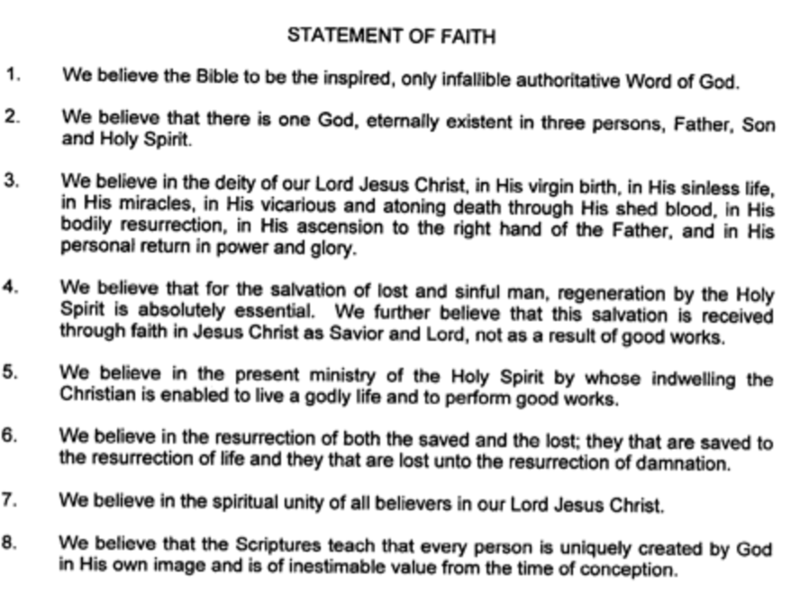 They took it to the board and had a lot of discussion but finally relented in allowing Catholics to sign the Apostle’s Creed as their statement of faith. They did inform me they had previously had other Catholic volunteers sign their statement of faith without a question. I apologized for the Catholics that should have known better. Isn’t the error that people are signing statements of faith to get jobs? #4 Problematic, because a lot of false ideas are implied here but not explicitly stated. For example, what does “regeneration by the Holy Spirit” mean? If it could be held to mean “baptism,” then a Catholic could affirm that, almost. * But something else is implied here. The authors are probably either thinking of an invisible act of the Holy Spirit not tied to baptism, or of a charismatic “baptism in the Spirit.” Also, the statement that “salvation is received through faith in Jesus Christ … not as a result of good works” is technically correct, in that we cannot achieve salvation solely by following a “formula” of works of the Law, but it implies that there is no role for works in the ongoing salvation and sanctification of man, which is an error. *The words “absolutely essential” are the reason I said “almost.” Catholics do not rule out the possibility that God can work outside the normative system he set up, even though the faithful are bound to it. #7 A Catholic understanding would more properly attribute spiritual unity to baptism, not to belief. Baptized people can be part of that unity without explicit belief (as with children), while some believers are excluded in certain key ways from that unity, if they are unbaptized. i would rather sign my name after bible quotes. why are creeds rewritten? i agree with aida. I think the first one is not what I learned from my catholic faith. But of course, if Mr. White and many other Fundamentalist Protestants do really believe that, then it explains a lot, because then a man can start whatever church he wants and claim that IT is the Church of Jesus Christ. 2. The statement is ambiguous and incomplete about the trinity. 3. should be His sacrificial death on the cross and His return should described as universal not personal. 4. should talk about water and baptism. Also salvation comes from the promised faithfulness of Jesus for which we show our faithfulness by works, repentance, and worshipping God with His sacrificial offering on the cross of His body and blood as He commanded in the upper room. 5. By the indwelling we participate in the divine life so that we can carry out the works God desires. we aren’t slaves nor automatons. 6. We believe in the resurrection and final judgement of both good and evil, the living and dead, for eternal reward and punishment. 7. There is a communion among those faithful in the Church, whether militant here on earth, suffering on their way to their eternal reward in heaven, or victorious in heaven. 8. The Church teaches, and the scriptures show … should probably use the word dignity in there.